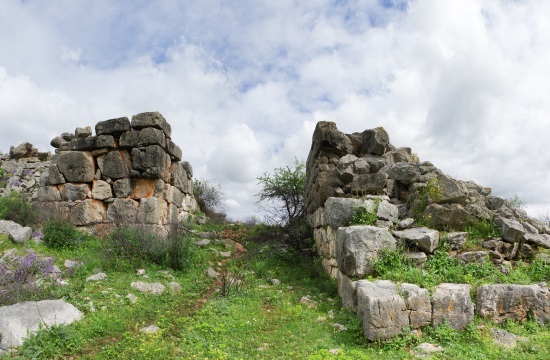 The Mycenaean acropolis of Gla in Kopaida lake (now dried), the widest fortified of its kind in Greece, preserved until nowadays, causes awe and admiration. So far, the significant excavation works in the area will be further advanced by the new five-year research program supervised by Ms Elena Kountouri, Director of Directorate of Prehistoric and Cultural Antiquities. Mycenaean Acropolis of Gla is constructed on a stiff rock in the eastern ridge of the tectonic submergence of Kopaida. The wide area fortified by a strong cyclopic wall during Mycenaean times, enclosing a 200-acre area, that is 10 times those of Tirintha and 7 times those of Mycenae. Following the great findings of past March, the new research program set in the area is promising as new and significant findings will come into light. Even though the confusion and misunderstanding caused by someone’s visit in official website of Professor Christofilis Maggidis, where he appears as Director of excavation work in Gla, Dr Elena Kountouri, Director of Directorate of Prehistoric and Classical Antiquities is the only Supervisor of the excavation works in Gla. The sole officially approved excavations works conducted currently in the area is that of Ms Kountouri under the auspices of Archaeological Society of Athens and there is no other licensed excavation. Professor Christofilis Maggidis is unrelated to the excavation. A few years ago, he had conducted a geophysical research study and not an excavation”. Ms Sophia Spiropoulou, archaeologist and team member of Gla’s research program, said. The research program is carrried out under a financial agreement with Region of Central Greece, that finances a part of the program. The excavation lisence was doled by Archaeological Society of Athens that started the excavation works in Gla under the direction of Professor Iakovidis may years ago, while the organization that undertakes the excavations management and managing the costs is the Directorate of Prehistoric and Classical Activities under the direction of Ms Kountouri. The significance of the research was stressed by Mr Vasilios Petrakos, General Secretary of Archaeological Society of Athens, related to the research’s scientific part, as he told “protothema.gr”. Last March, under the project Mycenaean Northeastern Kopais-MYNEKO 2016-2017 in Northern Kopaida, a systematic excavation research was conducted in the islets Aghios Ioannis and Pyrgos-Aghia Marina in lake’s northeastern ridge, under Ms Kountouri’s auspices.